Oklahoma’s truly global, FREE, all-day, eclectic roots music festival kicking off the Guthrie Green concert season and featuring major internationally touring artists on the main stage, the best local acts, performance artists, a kids’ tent with arts activities, community, sustainability and OK-made booths, and local food, craft brews and wines. There’s music everywhere…see you on the Green! Above: Fishbone working the crowd @ 2016 GLOBAL BASH. 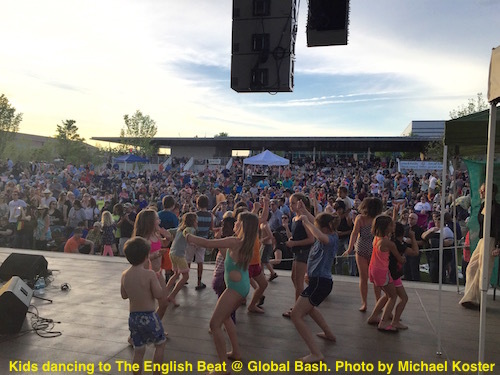 Below: kids dancing to The English Beat @ 2015 GLOBAL BASH. Big thanks to Hard Rock Hotel and Casino, Fowler Toyota of Tulsa, Que Bueno Tulsa, Greater Tulsa Hispanic Chamber of Commerce, Laureate Institute, Bank of Oklahoma, RSU 93.1FM, GTR Newspapers, Old School Bagel Co., Doubleshot Coffee, Lagunitas, Mr. Nice Guy’s, and Marshall Brewing for supporting Tulsa Roots Music’s GLOBAL BASH!